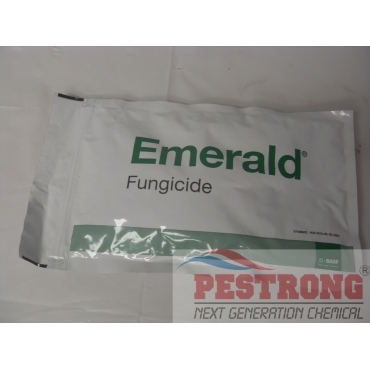 Where to Buy Emerald Fungicide, Emerald Fungicide for Golf Course - 0.49 Lbs - $183.95 for Sale with Fast Free Shipping! Emerald Fungicide for Golf Course - 0.49 Lbs works differently than anything else you’ve seen used to control dollar spot. Emerald fungicide is a systemic anilide fungicide for the control of dollar spot (Sclerotinia homoeocarpa) and bent-grass dead spot (Ophiosphaerella agrostis) in turfgrass grown on golf courses. Optimum disease control is achieved when Emerald is applied in a regularly scheduled preventive spray program and is used in a rotation program with other effective fungicides. Because of its high specific activity, Emerald has good residual activity against target fungi. Provides unprecedented dollar spot control in virtually every major turf species, and in every region, of the United States. Gives superintedents a true resistance-management tool. Fantastic fungicide. It's powerful, acts quickly, and takes care of all the worries I have. Wonderful.